The best newspaper, bar none, and one of my favorite pleasures. I read The Guardian everyday to check their perspective against other media output. I enjoy the Opinion writers, the Editorial Cartoons, and the best European coverage I have found. Thank you for through and reliable work. Absolutely brilliant and utterly fantastic. Super easy to use, the ability to follow specific journalists and even certain topics and then choosing whether or not to be ‘notified’ when said person/topic is published... quite possibly my favourite feature of this app! Everything, everyday, multiple times a day. Love this app! Outstanding journalism. I read this daily for both general news and sports. I also highly recommend The Guardian Football Weekly Podcast. Max, Barry, Lars, and the rotating cast of contributors make my commute much more pleasant with their insights about the beautiful game. The Guardian gives this American more thorough, nuanced & thoughtful coverage of my country & the world than any other source. Like the Guardian articles. To the point. Plus the Guardian does real research on many subjects. 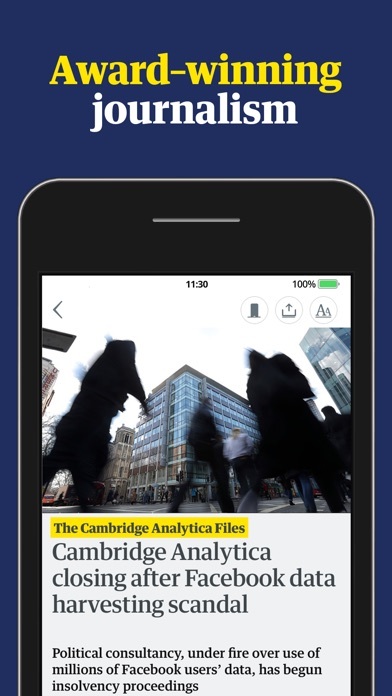 The app is seamless, the journalism reliable and even though their belief that the truth should be accessible to all without a paywall, which is truly noble in today’s profit driven media industry, it is well worth becoming a member to support them in their mission. The app works well on my iOS 12 phone. It’s stable and I find it easier to navigate than other online editions of print newspapers, e.g. The Washington Post. The journalism is reliably truthful and fact-checked. As well as in depth UK reporting The Guardian covers international news with less of an American slant than many English-language outlets. There are well-reasoned and interesting analysis pieces and longer form essays, often with excellent graphic design, although the more visually impressive pieces show up much better in a computer browser than in the app. Opinion pieces are still squarely in the progressive and leftist range. It’s pro-Labour but never just a partisan mouthpiece for the party. One change: The Guardian is no longer littered with the spelling mistakes and typos for which the print version used to be famous. 90% of articles are about Trump. Not about the UK. All Trump articles are negative, and biased. The Guardian never reports on the booming US economy or other positives. Why is a British newspaper obsessed with the American president? You get more accurate information from comic books. I love reading the Guardian. It’s one of the best sources for news since Fox! We appreciate The Guardian covering the good and the bad. Clear, concise, professional reporting. I'm a dedicated Times reader since I was 12, fifty years ago. I studied in England as a teen, before internet and I didn't realize I wasn't missing the papers from the State's because of the coverage the country gets around the world. When the Snowden story broke I started to read The Guardian and was struck at the quality of the journalism and frankly the breadth and brevity of the stories. It allows me to see the headlines, with versions to choose from, and enjoy reading the news instead of being dependent on television. I still subscribe to the Sunday Times but otherwise I can spend two hours daily reading it. The Guardian has been an excellent paper and I appreciate they ask for contributions rather than have a subscription rate. I realize a company has to know its income but for me, my income is too limited to subscribe to the papers. It's personally disappointing when journalism is so important and threatened, but realistically I can't do more. So the excellent quality will hopefully have more people who can afford more and do so. It is so easy, as an American, to only see news regarding the U.S. and this keeps us ignorant and sheltered. I have made The Guardian one of my set news apps to cycle through daily as it opens up my mind to see what’s up with other people everywhere. The Guardian is my go to app for relevant accurate news. The Guardian has become my trusted go-to for news. We need them now more than ever. Aces all around! Great in depth reporting on the news stories and thoughtful opinions on the opinion pages. Not only do they cover America politics, lots of other great coverage as well. I especially love their coverage of arts and culture. Keep it coming! Covers the stories many others ignore. I’m a word where facts seem to be irrelevant in some circles, the Guardian is a stalwart of truth and a beacon to those who seek the facts to form their own opinions. The Guardian reports the news, all the news, every day, without bias. No paper or network does journalism better. The writing is by far the best! The reporters come through the BS and take hold of the story. May be the best newspaper there is. News, Views, Clues: So few Can do’s Well as Youse. I get a great deal of substance from the content but their layout design is primitive. Read it every morning. Respect the reporting and trust it’s factual honest. Guardian is awfully far left, but occasionally a great article. I use this app multiple times a day. At least. Close to perfect. Joy to use. I’m grateful for the excellent reporting of the Guardian. Thanks. Unbiased, well written and current. Thank you for keeping the news fact filled and opinion absent. The Guardian is the paper I read first thing every morning ....very good reporting and excellent movie reviews ! I would prefer more fact based articles rather than hysterical opinion pieces masquerading as diligent journalism. Though I will keep reading The Guardian, much like hanging onto to a partner, even though they don’t love you anymore, hoping one day things will be right again. I love the guardian.... a true progressive newspaper. Great app, but why can’t I sync my home screen between devices? I appreciate the detailed & very informative information the Guardian journalists dig up & write so well! Thank you! Excellent reporting, writing and editing. One of the best at covering USA (and the world). I have gotten so sick of biased newspapers on both sides here in the U. S. and when I stumbled onto the Guardian, I quickly, after reading about your mission, signed up. It’s like walking through the forest on a late autumn day. How refreshing! That is what I like about the Guardian . Reading truth and I like their investigative reporting. A odd fashion substantive newspaper. Excellent journalism. Comprehensive world news and in depth stories, even series, on subjects illustrative of social or cultural trends - like police brutality in one California county or the Opiod Crisis or children bombed and starving in Yemen. It is a newspaper we need to keep alive. The Guardian, true to its name, keeps an eye on the world and informs us of what her marvelous array of reporters see and learn. Give money, whatever little or big you can. I give $25 a month, even as a social security fixed income 76 year old. 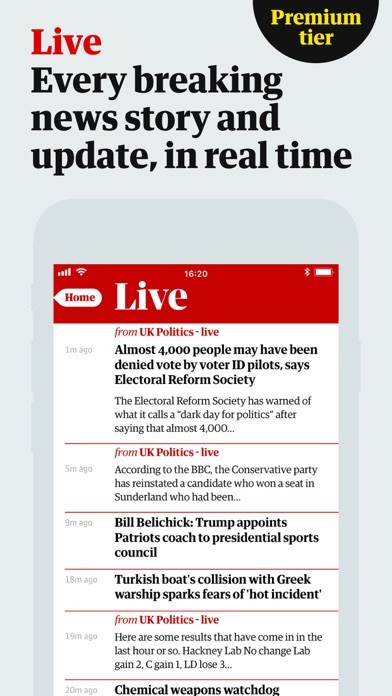 Thanks to The Guardian, I never have to answer ‘no’ to the question, from spouse and friends, “Did you hear/read about x?” One app, and I am up to date on all the news, all the time. Top notch, five stars plus! The Guardian is my favorite online newspaper because their reporting covers the globe, and reports and articles are well-written. As an American, I like offshore perspective. At their best, publications based outside the US have fresh insights and a detachment from the muck and mire of the desperate attempts of most US media outlets to sway, solidify, and sell political perspective. The Guardian gets just a little too close to the US, has a few too many US readers, a few too many left-leaning editorialists based in its US office, and it is starting to show. I like journalism that is aimed at readers who don't quite understand the US, and who certainly can't participate in US politics. Always targeted... always topical ... always timely. The Guardian is an outstanding newspaper with very high journalistic standards. Highly recommended. The Guardian is a refuge for many of us Americans. It is a comfort to read actual news and the mobile app functions brilliantly with a layout that looks great and is easy to navigate. But why, oh why did you feel compelled to change your logo? Why? That’s all I can ask. It’s one thing to update a look - see the extraordinary job Slate just did. You should read the hows and whys of Slate’s completion of the update. It took place over a L O N G period of time but everything about it was, indeed, an improvement. It’s another thing to change your brand. What you had was a logo that was iconic. If you wanted to color it black, fine, but what you did was replace an icon (in the true sense of the word) with an ugly ‘update’ that looks cluttered and very much like an elementary school class project did it. Did you pay someone for this sad scribble or, perhaps, the big boss has a grandson (no granddaughter would ever create something so uninspired and forgettable) who is dabbling in graphic… well, one hates to call it design, but there it is. Just go back. Do it quickly while it’s not so painful. Make it black if you must and I promise we will never mention it again. I would loved to have given you five stars but not with this very badly managed process of ‘design.’ It does not bode well for the future of other, truly vital aspects of your magazine. When management starts screwing around with solid components of a whole, it’s usually not long before there is nothing solid left. I count on The Guardian for its carefully researched, in depth reporting on important topics in the US and the rest of the world on topics often overlooked in US publications. I treasure my access to this outstanding publication. It’s all fantastic. Whether I’m reading US or UK politics, world news, or fashion and lifestyle, I get what I want from it. I also listen to many of the podcasts. Thanks especially for the investigations into Cambridge Analytica and for the Long Read. I have started contributing $$$ to support this important source of news. I urge everyone to do the same. The Guardian has excellent coverage of US politics, but it also surfaces global and groundbreaking investigative local stories to the headlines to help you escape the Trump news bubble. The app has a nice interface and I’ve had no problems using it. One if the best most ethical honest high quality news sources you can find. Non-profit, AD-FREE, and free to all (but contributions welcome)!!! Highly recommended. Guardian always governs the world of news! It’s so important In times like these-of Wholesale Political Corruption Coupled w/ a lack of ANY Moral Correctness, That we are able to get “Real News”- From sources such as The Guardian. Please keep on staying “above reproach” & / “Above-The-Fray”. The Guardian is the first site I open each morning to find out what’s happening in the world. Best on line news source, but why so many typos?! Important stories from around the world and culture, sports and food as well. A reliable independent UK news source. Great Writing, research in challenging circumstances, compassionate and inclusive viewpoint make this the best source for news. Guardian's name says it all! Since the Snowden revelations, when I learned the truth about the United States government spying on American citizens without "due process", I have followed The Guardian. The Guardian truly tells the truth, it's news is truly the lifeblood of freedom and democracy. I look forward every morning to reading The Guardian. I read several other newspapers online and The Guardian is my favorite. If you are interested in independent thought and in-depth reporting, this is the only one left in the world. It’s an institution on it own. Support it and treasure it. The Guradian is a breath of fresh air in a media market dominated by sensationalism. Thank you for Guarding our right to think for ourselves. Clear writing with little slant. Factual. Yea! For decades, the Guardian has served as an accurate and fair source of reporting. While none can perfect, they add the value of a moderate voice to newsgathering and analysis. As a US citizen, I rely upon them for an international perspective on this country and the world. This is the most readable and best written newspaper app on the web. Content is, of course, unparalleled. In these “fact free” times where many celebrate, encourage, create and disseminate misinformation, The Guardian is one of the few remaining beacons of evidence and research in this world. I use multiple sources of information to try to confirm news and information for myself. The Guardian is at the top of my list for reliability and pertinence. The Guardian also gets high points for the increasing courage required in these threatening times as one attempts to seek the truth. I appreciate that the Guardian doesn’t try to distract me with trivial entertainment type fluff stories. Great newspaper. Good writing and reporting and it really covers the world. great app. 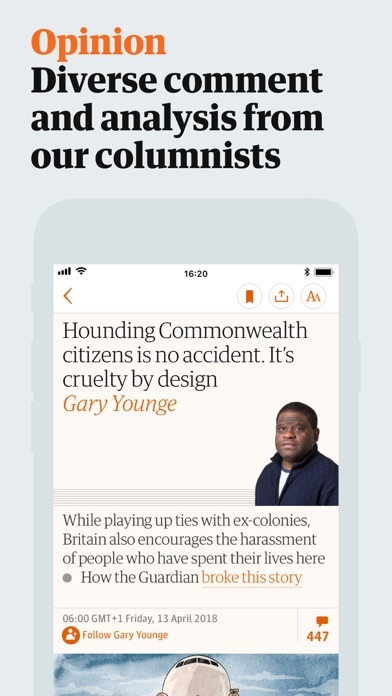 This app makes reading a paper on an iPhone a real pleasure And The Guardian is well worth reading: it’s probably the best newspaper there is. Always a good read and very informative. I read the Guardian for its depth of coverage of the news and for its objectivity. It allows one to read in depth on current topics, something that is less available in my local newspaper. The Guardian is a very good news source. The Guardian has always provided solid, reliable reporting- going deeper than many other publications do. I greatly appreciate the service it provides to all citizens that cherish free speech, transparency and accountability. I have subscribed to the Guardian Weekly for decades. I have relied on it for an informed view of news not only here in the USA but also throughout the rest of the world. Their stable of correspondents, commentators and reviewers are leaders in their fields. I expect to be a subscriber until nature takes its course. The trenchant and incisive articles that fill the pages of the Guardian never fall to address and challenge solutions to the vexing and troubling issues of racism, nationalism, sexism, homophobia, economic disparity, war, human rights abuses and environmental degradation that afflict our world. The underlying premise of the Guardian is that these uncomfortable issues-which together pose an existential threat to humanity-must be boldly confronted rather than papered over, misrepresented, rationalized or falsely denied. The courage, thoroughness, rigor, lucidity and vision of the editorial board and reportorial staff are extraordinary in this era of the largely predominating corporate-driven and corporate-compromised reporting in clear evidence in Western societies and far beyond. The Guardian is to be deeply commended for its status as one of the world’s leading journals of record. It is both invaluable and irreplaceable!!! Thank you so much!!! All the Best, Leon Michael Jones, Los Angeles. I have been following Guardian since I came to Uk from Kenya in 1969. Never failed me. I love The Guardian. Absolutely a great world class paper; none better. Really great news organization. I’m glad to subscribe to it. with few exceptions I always read the Guardian/ Observer and have done so for many years. The Guardian provides me with a non-American perspective on national and international news. That’s useful, because you never really see yourself as others see you. I often read stories that are not covered by US media. And I contribute, because I don’t want to lose the view from our most faithful ally. What The Guardian has achieved with this application is to show to what extent freedom of the press can go to in the modern world. To be a newspaper free off subscription and personal targeted advertisements is something that only a handful of newspapers have provided for their readers at the modern age. In all impartiality it must be said that the famously known leftist stance of The Guardian can be felt in their presentation of the news. But that just might be the reason that it has been highly popular at our time. Trying out the new premium tier and am enjoying it so far. The new logo is hideous so I’m hoping they revert back to it. It looks like a worse Golf Digest logo (search golf digest and you’ll see what I mean. The redesign itself wouldn’t be as bad if they did that. And it covers the world better too without giving plum columnist seats to monsters. Amazing world wide coverage of news and important , relevant topics on many areas: politics, economy, sports, culture, even fashion! Lets me find out what is going on just about the time things are happening then it provides amazing analysis and opinion articles. Love The Guardian. Latest update appears to wipe out all saved-for-later articles! Please fix. Love your app. Thanks for balanced and fair journalism in this world of fake news. Easy to navigate its easy to work with app for up to date information about what is going on in honest presentations. Great content but god awful design on the update. I resisted it until you gave me no choice. Feels like I’m reading the American New York Post, People magazine or Trumps National Enquirer. What a sleazy capitulation to the age of Trump. You look awful and complaisant. Tabloid for sure. Great way to corral new readers! Design is important and critical. You look cheap. You have failed. I love this app so much. It organises articles well with easy to find headlines and you can save articles for later. One the major plus ones is that there aren’t any ads which makes the app so much easier to use! I’ve yet to find a reason to complain. This is my go to source for news and more. I support The Guardian financially, it’s well worth it. It is gradually replacing my reliance on the establishment NY Times. And for soccer coverage there’s no comparison. This app is useless. It’s not user friendly. The guardian news is trash. Don’t download if you want real news. Simple to use, well designed. Did not load on June 11, 2018. Their staunch commitment to keeping their journalism freely accessible and not hidden by a paywall is admirable, and the quality of their journalism continues to be top-notch. The app is beautifully designed and easy to navigate. I’m excited for the new crosswords. Great newspaper, but the app redesign is a major step back! Latest version took another step backwards! What's with the tiny headlines? Most are one size, but others are small, and virtually unreadable. Make them all the same larger size — or, give readers an option to do that! The recent change in design colors remains hard on the eyes. The red-and-black scheme with BIG, BLACK, bolded headline fonts make the text harder to read and focus on — and more tiring to scroll through. This new version SCREAMS cheap tabloid; a Rupert Murdoch look. Another major step backwards. In contrast, our other iPad still has the previous version on it, with the original blue icon, blue section heads, and regular font headlines. When I used that today, I was struck by how much better it was. Much gentler, easier to read, and more inviting! Please bring back the old color scheme. Or, at least, give users an option of color themes — new, classic, dark, outdoors, etc. You also need to open up commenting on more stories — e.g., even tech stories often omit them, but expert users have much to add. By the way, *stop* adding the “What to Watch” or “Culture” sections to our home pages. We delete it, but after a week or two, they reappear! As to the newspaper itself, keep up the good work! You are an invaluable source of diverse news and progressive perspectives. I’ve enjoyed The Guardian’s reporting over the last couple of years, but just as I considered paying the monthly subscription to support their work, the redesign occurred. The announcement touting their new tabloid look was off-putting, and the color scheme chosen wasn’t any better. Why add to the stress of today’s news with an equally stressful red/black theme? The updated logo is bland, and lost the distinction of the blue icon, as well. I found myself opening the app and visiting the mobile site less and less, and now I’ll just delete the app from my phone. 5 stars for excellent reporting, 1 star for a harsh, unwelcoming design leaves me with an average of 3 stars. The Guardian delivers world class reporting of US, UK and global news. Because it’s a truly international paper with UK, US and Australian editions you get stories you’d never see in the US media, and perspectives on events that help you understand what’s really going on. The app itself works flawlessly. The Guardian features original and smart reporting. The writing is top notch. The paper shows real courage. Competent and imaginative journalism at its best. Has been my daily source for news over the years and I recommend The Guardian to everyone. As the usual news is depressing enough I’m also finding the colors and graphics difficult to look at. Content is ok most of the time. There is quite a bit of opinion disguised as “news”. And, the old app with blue, yellow and purple was Sooo much better looking than this awful black and red color. Thankfully I didn’t update it on my iPad. No paywall, no nonsense, great news. Excellent app (not talking about the content, which is in a category by itself)! Small footprint, easy on resources, runs even on my 1st gen iPad mini w/o a problem (while other apps crash or not even start). Content is well organized and presented. Thanks Guardian! 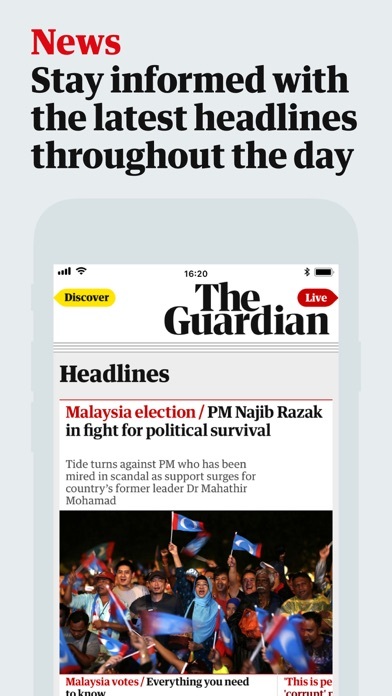 Updated Review: “Tabloid” is the perfect word to describe the recent redesign of the Guardian app. Its classic colour scheme has been replaced with a lurid and sensationalistic format that I find almost impossible to read. Reading the daily news in this age of worldwide strife and turmoil can be quite disturbing, and the layout and colour scheme of this updated app seem to have been purposefully designed to amplify the viewers anxiety level. 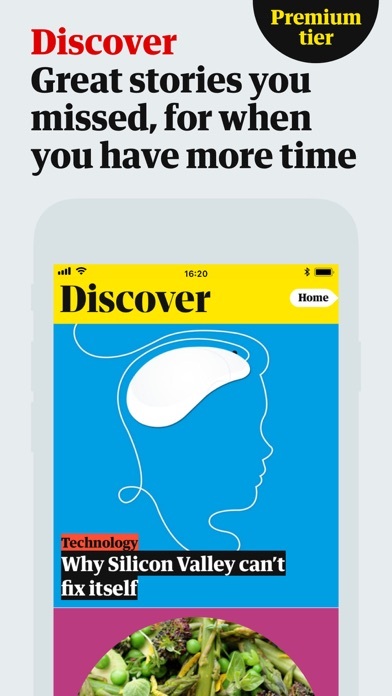 I have been a Guardian subscriber for several years, but after much soul-searching I have decided that it is best for my emotional well-being to avoid viewing this anxiety-inducing reinterpretation of the classic Guardian app. Unfortunately, my decision means that I have cancelled my longstanding paid subscription to this publication. From now on, if I feel the need to peruse The Guardian, I will simply access it with my content blocker equipped browser. So long, Guardian app… Original Review: My favourite news app; well worth the cost of a subscription. Their researched journalism is global and accurate. I trust them for consistent professionalism. I have read them for decades. Journalism I have found on the web. I no longer feel like mushroom! The often witty but sometimes tragic comments are always a source of entertainment. A great British newspaper. A different perspective on news around the world! Being an American it's nice to get a different take on news happening in our country. A great variety of topics covered. I like the music coverage. I too subscribe thru a small monthly fee...well worth it! I don’t usually take the time to review apps. As a devoted Guardian subscriber, though, have to say I hate the new app. Gone are the easy-on-the-eye blue and plum, the softer lines. Bring on fascistic, geometric black and red — along with white that makes the Nazi colors. In any case it’s all much harder on the eye, more off-putting to this graphic designer. I used to love clicking on that blue and white icon — by contrast the new app is like graphic barbed wire on the eye. Score one for a poor design choice. Like most upgrades these days, it’s a downgrade. Essential to a free society. In depth stories and fluffier stories from a British perspective. Love the app. Great journalism. But PLEASE give our poor eyes a night view. An all white screen when reading in the dark is blinding. Thanks! I've had this app for a while, but I deleted it. The Guardian is just as slanted and biased as Fox News, but only from the other side of the spectrum. They have the added spice of being a bunch of arrogant Brits looking down their noses at America. If they disapprove so much of American society and culture, they're more than welcome to cower in their homes within the Ring of Steel. Our first choice in news is The Guardian. We appreciate that they don't restrict readers with a paywall but we voluntarily send them money to support their work. We find them to be honest, well researched, timely, and fair. Great app, but why can’t I sync my home screen between devices?? i won't update till u change back to the old and clean one. I love the Guardian app. It updates frequently and always has interesting content. It is easily my favorite news source, covering stories I don't see in the American press. I pay to support journalism but I also pay to eliminate advertising. Not happy to be seeing ads. App has me logged in but when I click to eliminate the ads I’m asked to enter credentials again. Not ok. Also, sorry, not impressed with the redesign TBH. Form should follow function, not the other way around. It's the best news app I've tried so far outside of apps that pull from many sources. However, I'm not a fan of the new logo and color scheme. Blue and white was so much better. Update 2/8/18 Still the best, but now the tab button to get to the menu and settings does not stay at the top but scrolls along the side as you scroll and sits on top of articles partially blocking your view. excellent news source, unique and original articles, thought-provoking editorials. I purchased the monthly subscription and it is well worth it. The news that is covered and the links within articles is simply “Outstanding!” To be able to read current news and link to older stories concerning issues is incredibly fascinating and informative. Each day I find new information and detailed stories I didn’t know existed. I love the stories. Was reading up on Chernobyl and the newly installed enclosure and went through each of the links reading about life within the exclusion zone and the possibility of a solar farm. The content and how easy it is to navigate is simply awesome. One article and its associated links can lead to hours of fascinating information at your fingertips. If I could change one thing it would be to include easier crossword puzzles for novices like me that are working our way up to the more difficult ones. Best news app ever just got better. Thanks Guardian. Keep your uniqueness. May you prosper in the coming years. If you want news written with humanist instead of political agenda here is your source. Well worth supporting. Great writing and timely stories. This is my favorite news app. I really appreciate the Guardian's perspective on international affairs, and I love the in-text links to other news stories that provide more depth or breadth. One of the easiest ways for me to get informed on the go. Thanks, The Guardian. I read the Gaurdian for 4 years but finally had to say enough. Their OpEds attempt to silence free speech through virtue signaling and shaming(Final Straw was Benjamin Lee and Arwah Mahdawi, writers I will make effort to avoid from this point on). Actual news articles are extremely biased and jump to conclusions. Back to BBC and NPR I suppose. The Guardian is a great alternative news source for political news in the USA and in the UK. Excellent journalism and a great app to navigate through the stories. Great news, good app, well organized. But... since the last update, the exact same “Germany Works” advertisement continually pops up, sometimes 2-3 times per story read and nearly always without my touching the ad (accidentally); this ad even interrupts my reading of the ‘subscribe to the Guardian Premium’ app page. This bug is unfortunate because it makes using the free version of this news app nearly impossible and I dread switching news reports just to be free from this one, single, pestilent ad. It is insane and thoughtless. I’m never disappointed in the quality, substance, thoroughness and timeliness of The Guardian. Getting the story out right the first time is important, and the Guardian excels in the highest standards. I appreciate the Guardian’s through work. A thoroughly readable news site for the latest in topical, sports and entertainment news. The content is great, but this app is quite annoying. It seems I have to reload the fact that I PAY for it very frequently. Other news apps seem to maintain subscription info for very long periods of time, I’m lucky to get a week of The Guardian without having to go through hoops. Seriously. I’m giving you money, but you aren’t making it easy for me to desire to do so. Journalism: support it or allow powerful liars to carry on unexposed. We need journalism now more than ever. The Guardian provides us with the truth. In depth investigations, exposés, unvarnished facts, the science..give your support or live in the dark of ignorance. Our planet depends on journalism. The guardian has proven over the years that they can’t be bought. Give truth a hand. It’s cheap enough; subscribe today. Hats off and thumbs up to all of the Guardian staff. No need for extra words !!!! The world’s a rough place and the Guardian doesn’t flinch from reporting its news, good, bad, or terrible. Also, the app is polished as hell. 5/5, did subscribe. We look to the Guardian for free, unbiased news of events in the US and around the world. As citizens in democracies, we all need clear and unbiased reporting to hold our elected representatives to account and to understand the challenges we all face moving ahead in troublesome times. Living in Missouri means listening to Centrist views The Guardian always gives the view from the other side and that the world is indeed round. The Guardian app is so good it’s better than the Web site. It’s the only news I read outside of a browser. The Guardian is journalism at its purest. The Guardian is always on the cutting edge. The Guardian never lets me down. It brings me the headlines I am looking for. It covers the U S better than the US papers. I have been reading this source for several years. Non-bias with an open eye and a broader view of what’s happening in American politics. Wish they would run another special subscription price again because I would love to support them financially. Voluntary, no paywall financial support is a great idea. Thanks, Brits! Best news in America!! The Guardian is the first place I go to find unbiased and oligarch-free news that is without influence from corporate special interests. I also read (and have read) the WaPo for over 15 years and recently (6mo) ago added TG to my reading list. Stories are concise, editing is top notch, and background is thorough. It’s now the first publication I read daily. I read it seven days a week I never miss it. I count on The Guardian for the truth. Few sources out there that do not give you the neo liberal perspective.Best go to for climate change news. It covers America very well. They now force video ads on a news page. Unacceptable. Just look at the opinions section. I just counted the same ad pop up 8 times in 10 minutes. No I don't want an F150 thanks. One of the sources of news I go to daily. I have been reading The Guardian for many years. The newspaper keeps amazing me with their journalism - their language, their unflinching adherence to neutrality and their constant inquest to bring you verified information from across the globe, especially Europe and America. I am always a huge fan of their work. I find the Guardian news services timely, honest and thorough. Living in the United States and frequently traveling to Europe , The Guardian keeps me well informed. This is a first quality news service. Hits my phone first every time ! Amazing connection for extraordinary world news. I have been trying to find a good news source that isn’t slanted left or right. I reluctantly signed up for the subscription trial as one of the claims of the Guardian is that they are not catering to the left or right. Journalism used to be about reporting the news but now it has all propaganda throughout it and I for one am tired of it. I would like to read the articles that are not skewed and I didn’t feel I got that from the guardian. While somewhat better that is not good enough. True journalism has died and I will not support any newspaper or news source that uses its power for propaganda. You can definitely tell by reading the stories that they slide mostly left. Because of this I don’t trust it as a source. I think everybody should be this picky because journalism should be preserved, it has become jaded & we can no longer trust it. Whatever one feels should be left out of anything but opinion. People are tired of this kind of reporting, they need to go back to core values and just report the news. While the Guardian is an as obvious as CNN or FOX, it’s still obvious. Most people can remember Walter Cronkite, he was liberal as liberals can be, but you didn’t know it because he kept it out of his journalism, I didn’t even know that until I went looking. And I could give you other examples of the old-school journalists who did the same and that’s how journalism should be. I will not support any new source until I find one like that. In my opinion when they allow their beliefs to become embroiled in the story, it alters the original story and facts and in this day and age people are tired of that. We have no sources left except maybe local sometimes, we can no longer trust what we read or see because everybody has an agenda. The best way to eliminate that is to start reading and watching those who do it. Either they will learn and change or their platform will die out. Please don’t claim to be something you are not guardian because you’re not unbiased and it’s very obvious. There is a website that rates new sources and it’s pretty accurate,Google it. I didn’t search for it until I had read quite a few articles that were biased and this bias skews the facts to the writers agenda. My guess is that media news outlets will continue to lose money unless they go back to their core roots and leave their opinions where they belong, in the editorial section! As for the app itself, the app is well designed, if only your journalists were as good as your app developers. I am tired of being lied to by the media and feel betrayed and I hope others are smart enough to see through it. The most distorted news possible all the time. The Guardian lies more than Trump, and that feat takes some effort. Good for arts and special interest stories, but otherwise not worth reading. No grip on reality! The Guardian does an exceptional job of accurate detailed reporting. They also are incredibly quick at getting the news out to the world. I am extremely happy to continue to support such time investigative reporting. And an easy to use App. The Guardian ha proved. Reader supported model can produce great reporting and a great newspaper. You should read it and support it. Facts. They exist. They matter. Who knew? My number one source for authentic news reporting and high quality writing. Best reporting out there...bar none. The Guardian is what one expects from a news organization-accurate, detailed reporting. The Guardian is my go to news source. I like the daily briefings which provide me with a quick look at the morning news. The app is also really good and easy to navigate. The Guardian is an independent voice for quality journalism. That’s why I support it. The Guardian shines the light of truth upon the actions of the powerful, and chronicles the struggles of humanity in a dark and dangerous world. We the people need this support for our democracy to survive the assaults of tyranny and oppression! A daily source of news and analysis. Every single day now I get a pop-up message asking me if 'I'm enjoying the Guardian?' Just as bad as the non-paying version with its ads. Even after I’ve registered my initial 4 star rating, I still receive these daily torments. On today’s ‘review’, you get one star. Bye bye Guardian. I’ve had it with your millennial mindset needing constant approval and input with which to stroke your leftist ego. ...but the endless stories of suffering animals, about which I can do nothing, has caused me to eliminate the app. It is just too depressing to know of every sick whale and abused tiger on the planet. I love The Guardian’s insightful, comprehensive, well written articles. Thank you to everyone on The Guardian’s staff. Information,disinformation, false flags, cyberwar: these are a few of the modern news challenges. Awhile back are trusted friend suggested I use The Guardian as a third source for perspective. It was wise advice. I turn to the Guardian daily for a trusted third view. The Guardian is in the same league as the NYT and the Washington Post. If the reader is interested in World news, better. As a daily follower of the Guardian I have the highest praise for the insights gained, the opinions expressed and the news reported hours before other sources are able to react. I love the Guardian. Keep up the good work! As well as the best written, hands down. Covers environmental, international, and agricultural news well. More factual than most other media outlets and local/national/world news sources. I love the in-depth articles. The Guardian is one of my three favorite and most respected news sources. Writing style and research depth make this a must read. The requirement of all financial participation to include “payment automatically renews” prevents me from subscribing. I will happily pay a premium price for an annual subscription that I must actively choose to renew. I enjoy reading/following the Guardian for its “non-partisan” approach. What I read I’m aware of a certain bent. The Guardian presents a more balanced outlook. Thanks. Keep up the good work. No paywall. Honest and diligent leftward leaning news. They hold themselves to high journalistic standards one of which prevents them from putting up a paywall. Journalism is essential I wish they would allow you to support them on a sliding scale. My current job situation won’t allow it. Only improvement would be a slide towards the center to fill the void in nuanced and democratically available (free) journalism. They are the last ones standing it seems and they lean so left. Download. Read. Support. Knowledge is our lifeblood and without free journalism we all die of ignorance. The Guardian is the breakfast of media champions. Clear, concise, detailed, well-written news that does not require untangling by reading other sources. I don’t who will read this. I find the Guardian’s ability to include reporting, analysis, reflection and comparison within the same piece constantly refreshing. In the US the ‘serious’ papers separate reporting and analysis. The front page carries the facts without comment although the subject matter may imply treason and an existential constructional crisis. You have to wade through to the opinion sections on back page (pace NYT) for any analysis. Even then, it is a week later and, in order not to appear biased, they include pieces from either side of the fence, no matter where in the swamp the fence has been erected. Some stories - the role of Russian and other oligarch money floating the US property and fine art markets - hang around in plain sight for decades without being reported. When the festering sore breaks the surface, it is with with instant shock and horror - but that is another subject. Understanding the world without the Guardian? Unthinkable. Very Democratic/left leaning news. I am deleting my app!!!! I love using the Guardian app, it works perfectly, refreshes often, works offline, its notifications are inobtrusive, I have set up which sections I want to see in what order, and I don’t have to revisit it. First rate writing, broad base news coverage. Love this newspaper and it’s an app. The best free access print media online. The Guardian is superb and so is the app. Easy to use. Ever notice that the Guardian is instrumental in the greatest exposes of our time? Think about it; Snowden released his story thru them, the Panama Papers on foreign hidden assets revealed by them, the Steele dossier etc etc. The Guardian actually reports the stories that other news organizations spend time speculating on. Their news organization doesn’t bog down on trivia, minutia & hyperbole but digs up the info, raw & un editorialized. That is the opposite of ‘fake’! Always good to get a different perspective. I am enjoying this app a great deal. I like seeing how someone from another country (UK) sees my country (US). There is a US version of the paper. I especially appreciate that The Guardian is keeping track of the number of US citizens killed by police. This information is not easily found in the US. Although access is free for this app, I donate whenever possible. High quality reporting. Not, as far as I can tell, answerable to any narrow self-interest. Not advertisement-driven. Subscription based. What democracy depends on and autocracy fears. The best. Did I say the best. Ten years ago, when I lived in LA, I would buy the Guardian Weekly, custom printed and bound by staples. It got me up early lest it be sold out. The Guardian gives me a world view of the world. I miss the paper version but when I go to England maybe I’ll get my fix. When I’m London I lose out to the seven newspapers I try and read daily. The internet makes the world a smaller place the Guardian is the go to single source for me. Used to be classier, more elegant and easier to read in the older white and blue format with its distinctive font. I’m sure they paid a lot for their current styling but it wasn’t money well spent. The Guardian now looks and feels like so many other news sites and has lost its visual individuality. I persevere with The Guardian only because the quality of its reporting redeems it a little. When I am on the road, I always turn to “ The Guardian” above any other West Coast newspaper. The news is well written & succint! Hurrah for the UK! It’s quite simple, without the Guardian’s investigative reporting you’re in the dark. What news used to be and should be with ease to navigate. Nice to be able to read full articles offline. Very handy. What strikes me the most is how US news is so easily distracted. Misled. And defanged, especially by the likes of a charlatan named Trump. Serious reporting on global issues is necessary for this flat earth to survive. This news source is a good place to start, as is the Beebs, Economist, . . . Wait a sec. that is all Brit news! Ok, I can accept that. Great coverage. Source for in-depth news from around the world. Without a doubt, The Guardian has the most outstanding group of reporters of any newspaper, anywhere. All news is concise, to the point and offers clarity to all topics. I always come to The Guardian for my news. Thanks for a great read!! I enjoy the Guardian perspective and recognition of right and wrong when justified. “Fair and Balanced” is for Sports, and it’s definition has been deformed by Fox in the US. If you haven’t subscribed as yet, please do as this site is excellent for all the important news of the day. The above has been my observation from the once a week paper copy of the 1950s received by a friend, intermittently through the decades, to the present. The strong suite is that The Guardian has been a breath of fresh air all these years! Good solid paper, an everyday go-to. I trust what you publish. You are the only news on my iPhone and iPad except for Facebook. And I post your publishing gs on FB because I trust you. Thanks! I consider myself a realistic conservative and believe most of the Guardian articles are informative and worth the price. However, some of the articles are very liberal and simply test your ability to count the flaws. I lived in London years ago and discovered the Guardian. Well written, well sourced, well done bc the print is newsworthy. App interrupts use to beg for a rating. That behavior caps my rating at one star. I hope you’re happy, Grauniad. Great paper, great website, great app. No fair and balanced (fox) rather thought provoking and insightful. I’m a big fan of the Guardian’s thoughtful journalism. I read it on my tablet first thing every morning to get oriented. The material is well organize with a great user interface. Five stars! The Guardian is the best source for international and US news online. I appreciate that they are less caught up in party politics than most US based sources. Brilliant! Give that woman a Raise! As Americans living abroad, we rely on this paper and its staff for daily news, on-the-money opinion pieces, and a sensible world view. It’s my first source for news about America and American politics and I live IN the USA. I also enjoy the (proper) football ⚽️ coverage. No day should begin without an objective view of the world - whether we begin early in the morning, midday or in the evening. That is what The Guardian offers. Very good writing and some unique viewpoints. They cover American issues really well. The Guardian is a refreshing daily read, alongside my reading of the New York Times. It has less coverage but more attitude. It also is a little more international. I have to say that I resent the fact that the Guardian marketing department sent me a pre-written recommendation for the Guardian when I offered to recommend it on the App Store. Too bad. This does paper deserves better. I turn to the Guardian for news and information on environmental issues, biodiversity and climate science. I am also grateful to learn in depth about what is happening around the world. The Guardian is excellent, reliable, up-to-date, and well written !! I’m enjoying it it always. I started reading the Guardian in the spring of 2016 because I wanted to see how our election was being seen outside the USA. I also thought it’s coverage might be more balanced. I was not disappointed, and quickly became a fan. In addition you get excellent coverage of soccer and hews from Europe. Excellent reporting, lengthy articles by important writers like Thomas Franks. I find the guardian my go to for politics (Gary Younge), Art (the brilliant Mr. Jones), etc. etc. I love this app. Great journalism. Great format. Updated often. Maybe the premier news app around today? Thanks. Excellent website. News can be biased but so are all papers. Great variety. Enjoy food lifestyle and cross words the most! I could love this paper if they’d dump a few silly and unqualified “opinion” writers. They also run utter rubbish on some topics and then call it a “controversy” when it’s just a ridiculous bit of false equivalency. The science page itself is quite strong, especially Ian Sample. The Podcast has suffered from the loss of Alok Jah and the subsequent addition of some young women with horrible presentation skills. “Talk me through it” is not a substitute for interviewing skills. Thank goodness for Mr Sample. I hang in here for a few of the outstanding columnists; i.e., Jill Abrahamson and Richard Wollffe. For a quick, concise place to look to see what’s going on in the news, I click on to the Guardian.i can get the updates to keep up with the news as it happens. The Guardian is simply one of the best news sources there is. I have been reading it for 50 years and it has consistently maintained the same excellent quality. Reliable, well done, always on point. The splash screen still shows the old logo when opening the app from widget. Just some inconsistency quirk, otherwise 10/10. Love the Guardian. The newspaper and the app work together in harmony to deliver great and interesting news articles. It seems The NY Times is bought out by the “liberal” elite while The Guardian is more radical and grass roots. I love the new redesign! I had mostly stopped reading after the last redesign a few years ago - the light weight font (especially in white text over magenta half-device-width squares) was really hard to read. I also found it cartoonish, but the main problem was I couldn’t read it. I went from a daily reader, to just checking occasionally for balance against my other news sources. The new design is bold, more serious, and easy to read. Thank you for respecting my larger type preference. I’m back as a reader! I have ignored, with some guilt, your donation requests. Going forward I’m happy to donate, as the format now allows me to enjoy your valuable content. When you're looking for introspective news about a plethora of current topics, where else would you look, but to The Guardian? The Guardian is great. I read it everyday. I'm dropping a star from my review though because the new icon is so bad. I loved the old logo. The blue circle-masked lowercase "g" was distinct, unique and popped out in a sea of apps on my home screen. The new, black and white, times roman, capital G in a circle feels like any generic news publication. Worse, the app is hard to find now when I scroll through my apps and the widget icon, wow, I can't even tell it's a G. It could be that stupid new uber icon for all I know. Seriously, I understand the world is a depressing, polorizing place these days and the new black/white logo might be meant to represent the times, but please, when Trump leaves office, can we have the old logo back? Finally, Yahoo and the Gap both changed their iconic logos an few years ago. The Gap changed theirs back and still have a business, yahoo not so much. Please don't be the next Yahoo! Honestly, well done developer team/UXUI team. It's an incredibly fluid app, and stable. Thank you! Thanks for giving the app such a huge overhaul! Absolutely loving the fluidity of the app and the new aesthetic, minus the prominent red colors. I was definitely much more of a fan of the blue colors, as it comes off more trustworthy and benevolent. That might sound crazy but I think that’s definitely backed up by some psychology. Something to consider, but doesn’t take away from my review at all. I was looking for news and all I found were articles like the Enquirer would run. Deleting app. This is a great app, as long as you have connectivity. I really wish it would allow for better offline reading without having to find the stories, save them, and then remove them from save later on. The daily edition downloads the entire newspaper but that’s a separate subscription. Still, awesome newspaper that’s keeping up with the times without compromising journalistic quality or integrity. The new app is visually inferior. Fonts are bolded, making them blocky and heavy, letters atop each other with improper spacing. The color change is also bothersome: where cool blue predominated we now have reds and blacks. The excessive use of red (especially in the Spotlight section) gives an ugly vibe of Alarm. It used to be the headlines and content that gave reason to be concerned: now just scrolling through the app and getting hit with bold, red words causes anxiety. It seems a step backward. There’s also much more dead white space. Would love to see a reversion to cooler colors and crisper, unbolded lettering. The content here will keep me coming back but probably not as frequently or happily as before. Thank you, GUARDIAN. Your contributions to international discourse and efforts to combat the miasma across the pond are invaluable to me and the world. I share your articles weekly. Best regards.